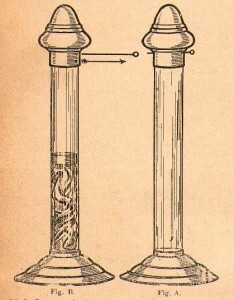 The legitimate effect of the experiment is that two glass cylinders are placed upon separate tables, one containing a blue silk and the other empty, two small lids are placed upon the tops of the cylinders, and without any cover the silk leaves one cylinder and appears in the other. 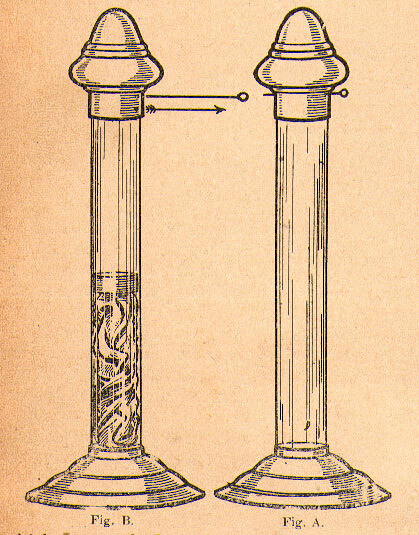 I have tried to make the construction of the cylinders clear in the accompanying illustrations, and it will be seen that they are both mounted in, a small plated base to the depth of half an inch, the covers are just plain caps, one solid the other hollow. There is in one lid (A) a circular disc, about half an inch in depth, having a hook attached in the centre, fitting into the hollow section. The other lid (B) has a similar disc, but without the hook. The discs are held in the lids by a small pin running through the lid, illustrated at (L) in each case. To prepare for the trick two similar soft silk hand¬kerchiefs are required, one of which is attached to the hook on the disc fitted to (A) and pushed into the hollow cap, the disc closing the aperture and being held in position by the pin. The heavy disc is placed into the other cap and the pin passed through the same. 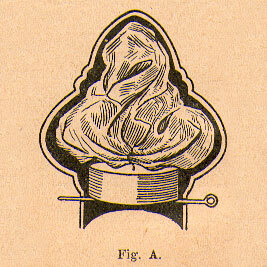 The second silk is shown to the audience, and placed loosely into the cylinder (B), the cap is placed over, and the other cylinder (A) placed on one side table. Now, when your assistant releases pins the weights drop from the cylinders, one going down brings the silks into view, the other forcing down the visible silk into the space at the bottom of the stand, air holes being bored to prevent the cushion of air from slackening the speed of the drop. It should be noticed that the disc to affect the vanish should be of such a size as to slide down the tube easily and not turn over.